Sabaidee…. Welcome to Laos! 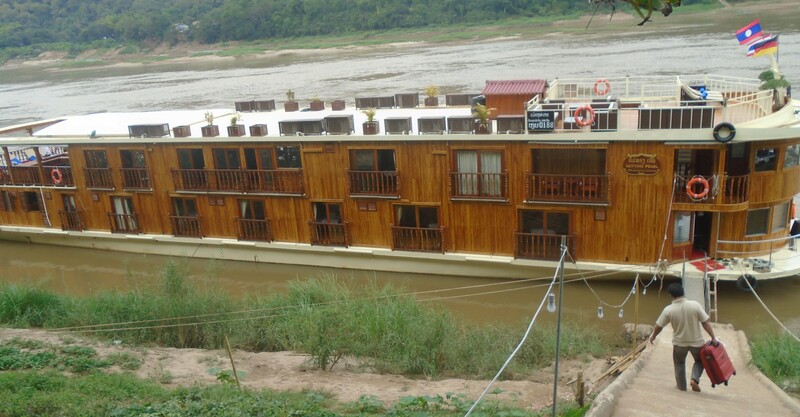 – A cruise along the Mekong Delta! It was the beginning of September when I heard the golden words from by boss “Ashish. I would like to send you on a cruise to Laos. Would you be interested?” For a moment, I could not believe my ears. “Yes Sir! I definitely want to”, was my immediate answer. 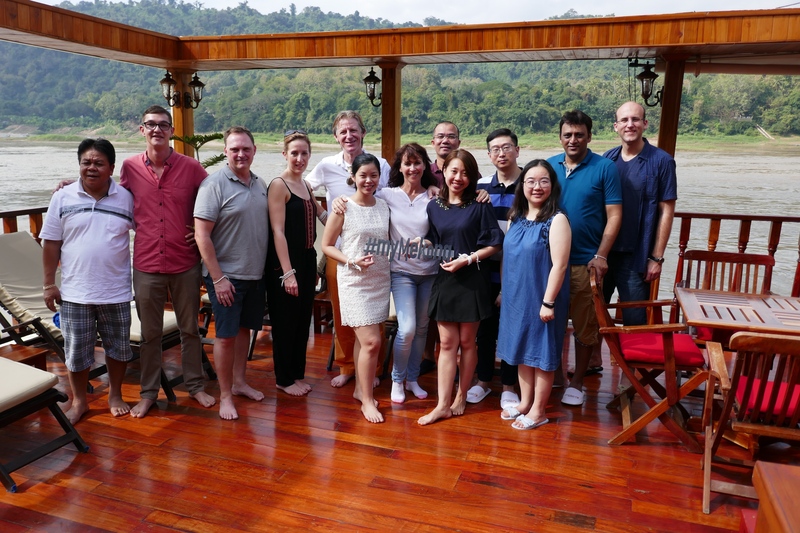 I started preparing for my fascinating trip on the Wild Mekong river – on a beautiful private vessel called “The Mekong Pearl”. My flights were immediately booked and I started gathering necessary information about this excursion. Visa was not a problem, since it was on arrival and I had my passport ready – waiting to be stamped. Finally the day of departure arrived. I was at the Chhatrapati Shivaji Terminus, Mumbai airport doing my check in and the necessary immigration and security checks. The flight to Bangkok from where I would take the connecting flight was under 4 hours 30 minutes The Suvarnabhumi International Airport, Bangkok is quite huge and has no walled fences and it was normal for the locals outside the airport to see the planes landing and take-off from the runway. 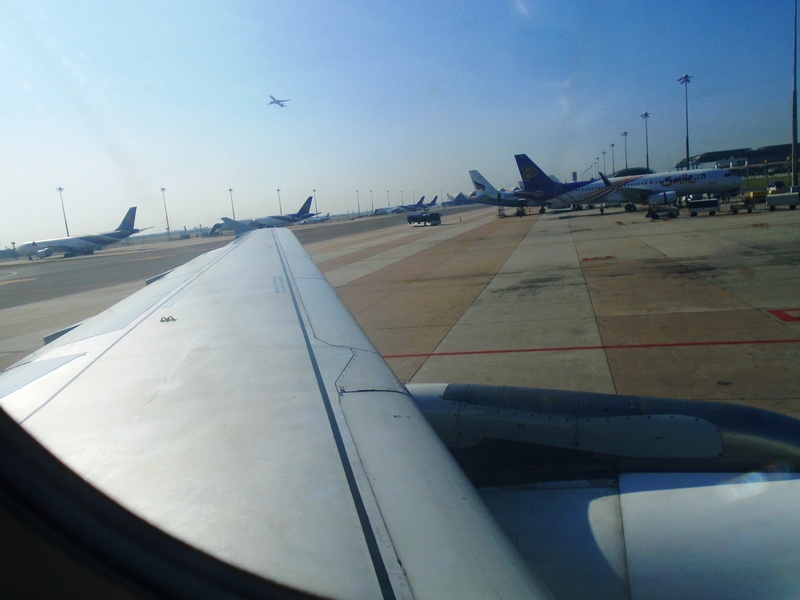 I had ample time before connecting to my onward flight to Luang Prabang where I arrived within 2 hours from Bangkok. 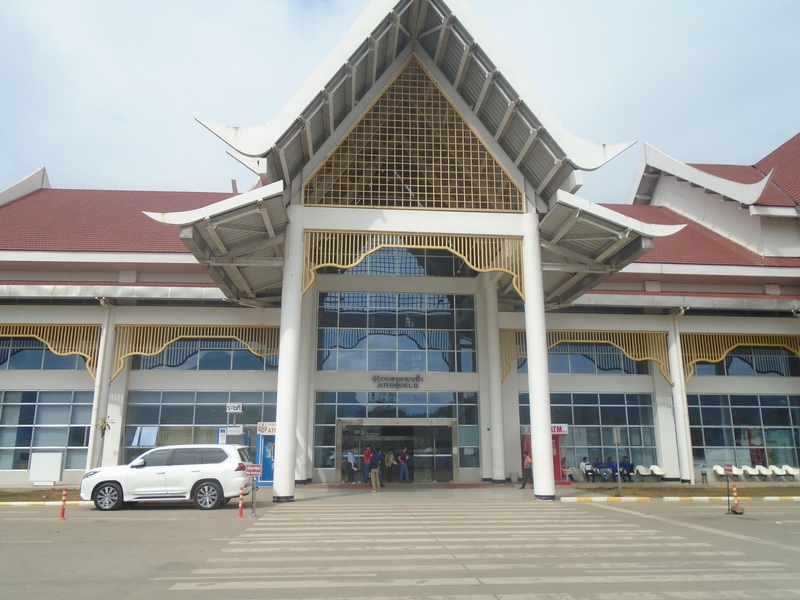 Getting visa on arrival at the Luang Prabang airport was quick and easy, one of the few countries where Indian visitors can get visa on arrival. 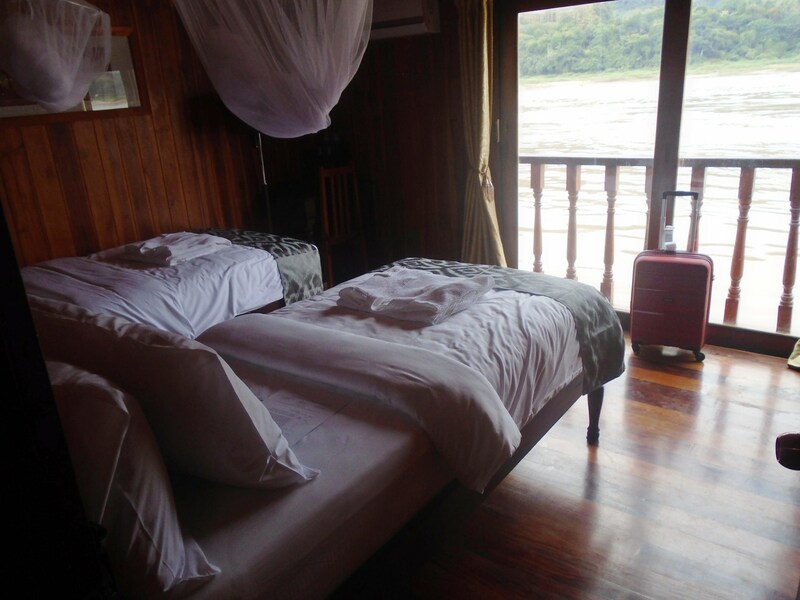 On arrival , the driver who received me took me to the “Mekong Pearl “ which was 20 minutes driving distance from the airport. The first sight of the ship was amazing. It has three decks with all outside cabins on first two decks (ground and first levels), an aft deck on the first floor and a sun deck on the second floor. The vessel had a small welcome area where one can remove shoes and wear the footwear provided for use inside the vessel. On entering, a staircase to my left went to the first floor, a spa and massage room was on my right and another staircase was at the opposite end. I was welcomed by my Tour Director who showed me my room and invited me for lunch. My room was a superior room of nearly 200 sq feet, with wide slinging windows and a French balcony. The room was fully equipped with all amenties that you will find in any hotel room, well lit and had a good view through the French balcony. 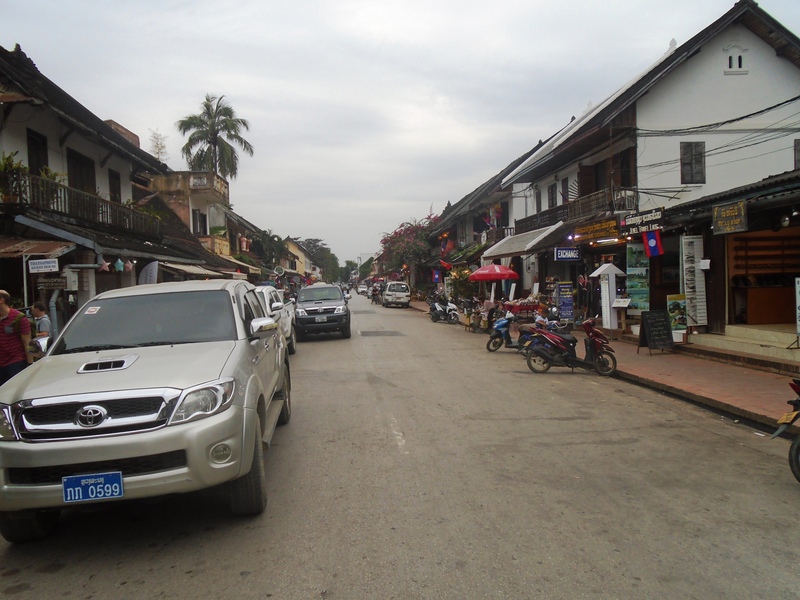 Luang Prabang, a town in the northern province of Laos is a UNESCO World Heritage Site and lies in the valley where two rivers Mekong and Nam Khan meet. 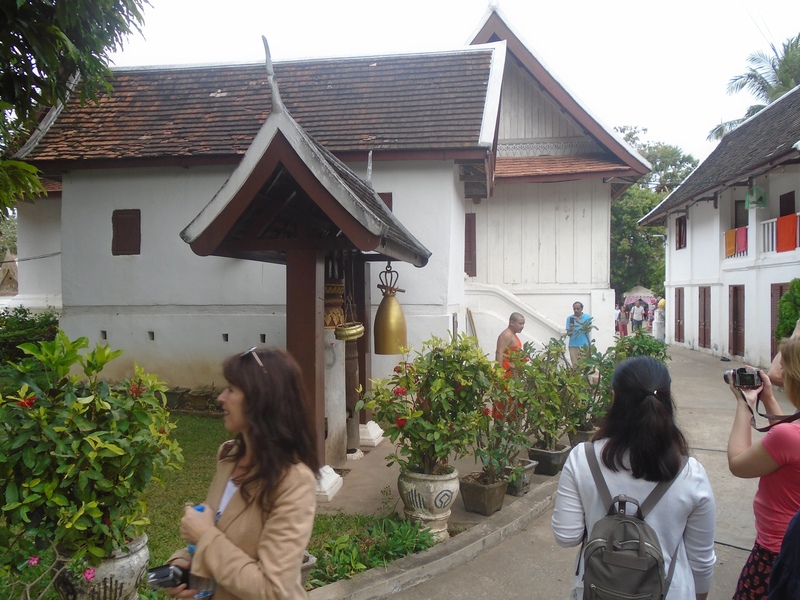 Luang Prabang is known for its numerous Buddhist temples and monasteries. Inhabited for thousands of years, it was the royal capital of the country until 1975. It is known for the Buddhist temples Wat Xieng Thong, dating back to the 16th century, and Wat Mai, which was once the residence of the head of Laotian Buddhism. 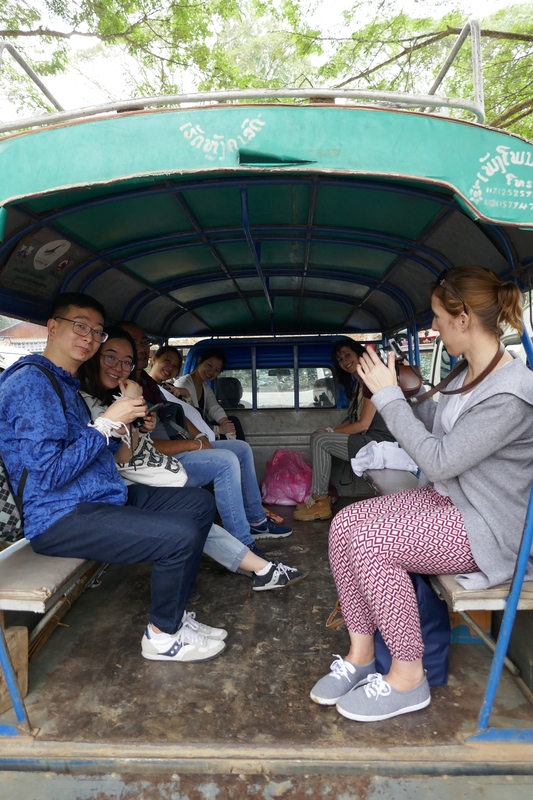 Post lunch, we started on our first excursion – A walking tour of Luang Prabang. We met our guide Mr. Joy, who was cheerful and knew the place very well. 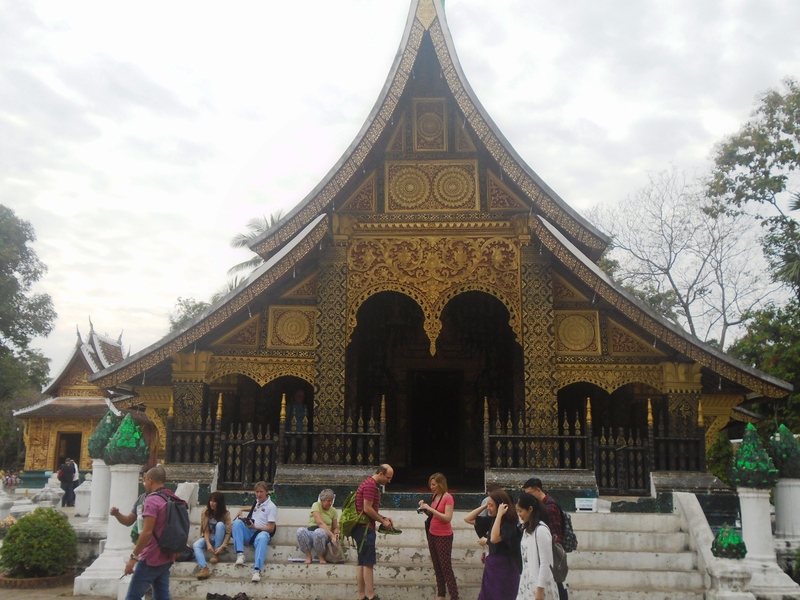 He first took us to the Wat Xieng Thong (Temple of the Golden City), a masterpiece of gables and intricate golden carving, which was just across the street. 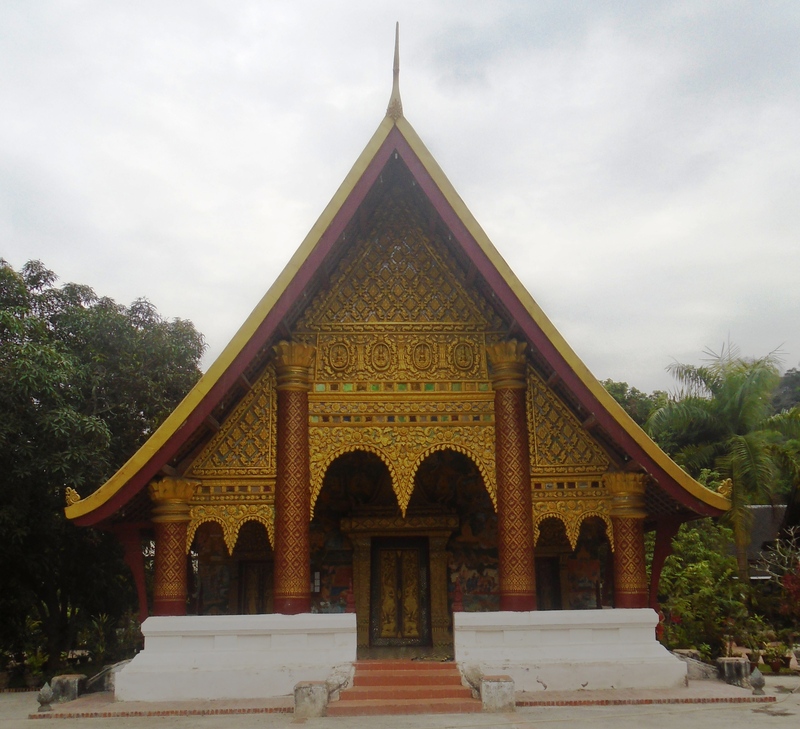 Wat Xieng Thong is one of the most important Lao monasteries with over 20 different structures. Here one can see the shrines, pavilions, residences and stupas that contain Buddha images of the period. One can also see a reclining Buddha, lovely paintings depicting stories from the past, and royal funerary carriage house, where it houses the funeral carriage, which stands 12 metres high. Our guide showed us an empty shell of an explosive device which was used as a bell. Every day at 4 am and 4 pm , a monk comes and rings the bells. It is important to note that you need to have proper clothing – dresses or skirts should be below the knees and the body should be adequately covered whilst visiting places of worship.Whilst entering the monasteries, remove your footwear outside and then enter the building. 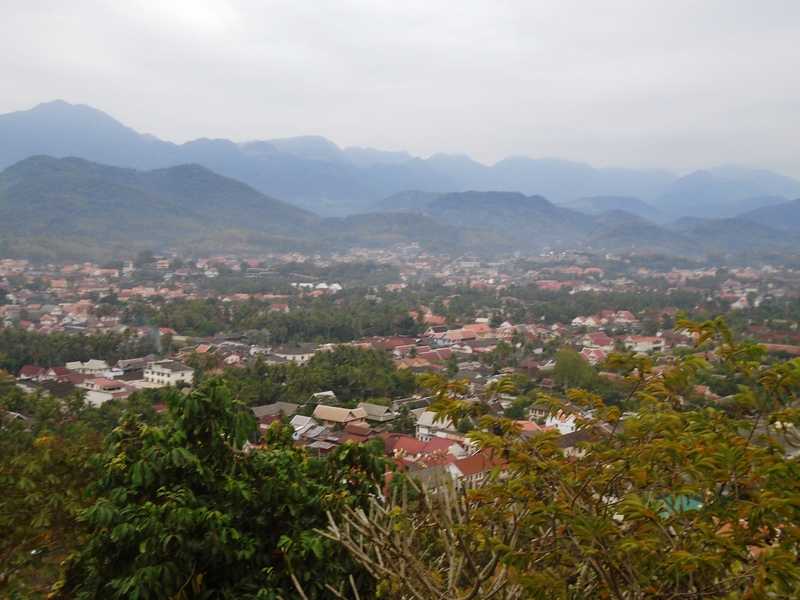 Thereafter, we walked through the lovely streets of Luang Prabang and reached Mount Phou Si which is right in the heart of the town. 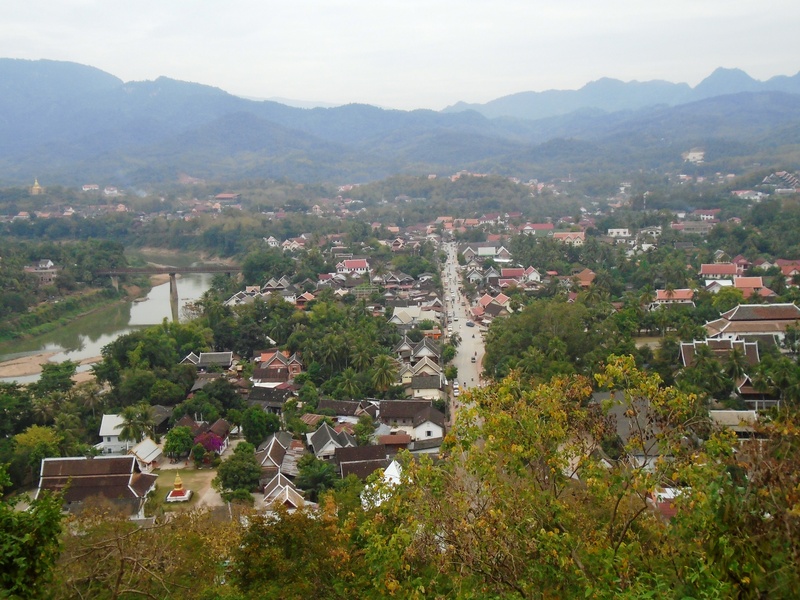 We had to climb 328 steps to reach the summit of Wat Chom Si from where you can get a panoramic view of the Mekong, the Nam Khan and the pretty rooftops nestled below. This is considered a must see to witness the mighty river, mountain and the sun setting behind it. We enjoyed the breathtaking view of the town, in spite of it being a cloudy day and took a few stunning pictures. We walked down the hill and saw people setting up tents for the night market. 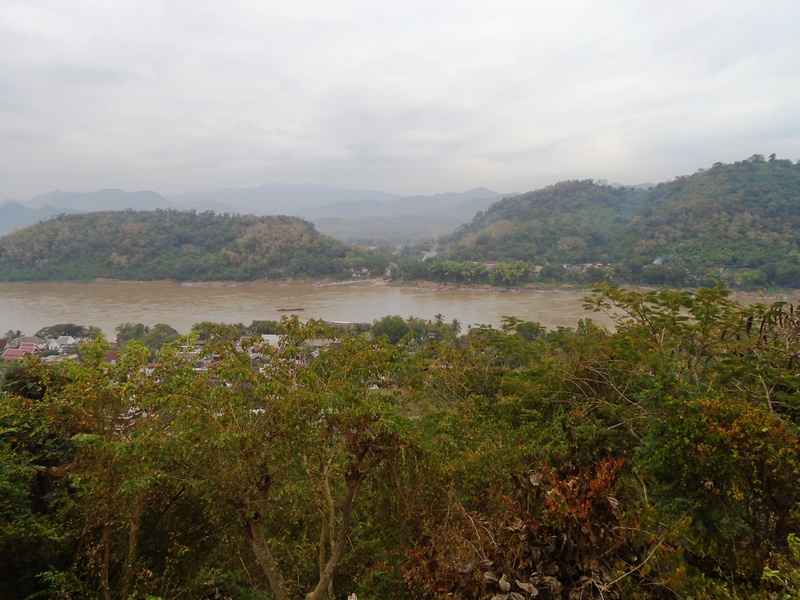 We reserved this exploration for the next day and walked back to our boat after a long and interesting day exploring Luang Prabang. 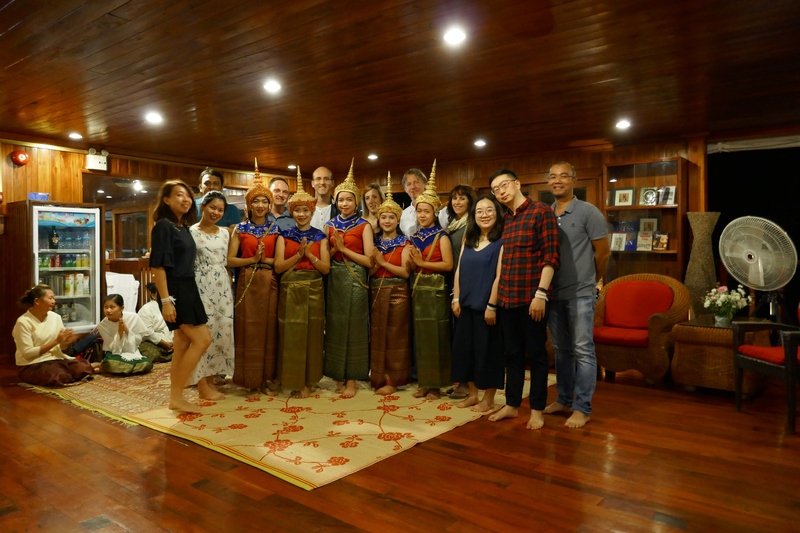 Later in the evening, we attended an important ceremony (on ship’s aft deck) that is practiced in Laos called “Baci ceremony” which means “Calling of the Soul”. The Lao people believe that the humans have 32 organs and a soul for each to protect these organs. It is very hard to keep all the souls together at a given time. So they perform this ceremony so that as many souls can be kept together. This ceremony is performed to celebrate important events by praying and tying a white thread on the person’s wrist wishing him good luck. After the ceremony, we were entertained with local music and cultural dances. We were treated with a small glass of local rice whiskey called Lao Khao followed by dinner. As everyone had flown in earlier in the day, we all had a quick dinner and went off to bed early. Our Tour Director had planned and kept our next day schedule ready for us to know when we got back to our rooms. 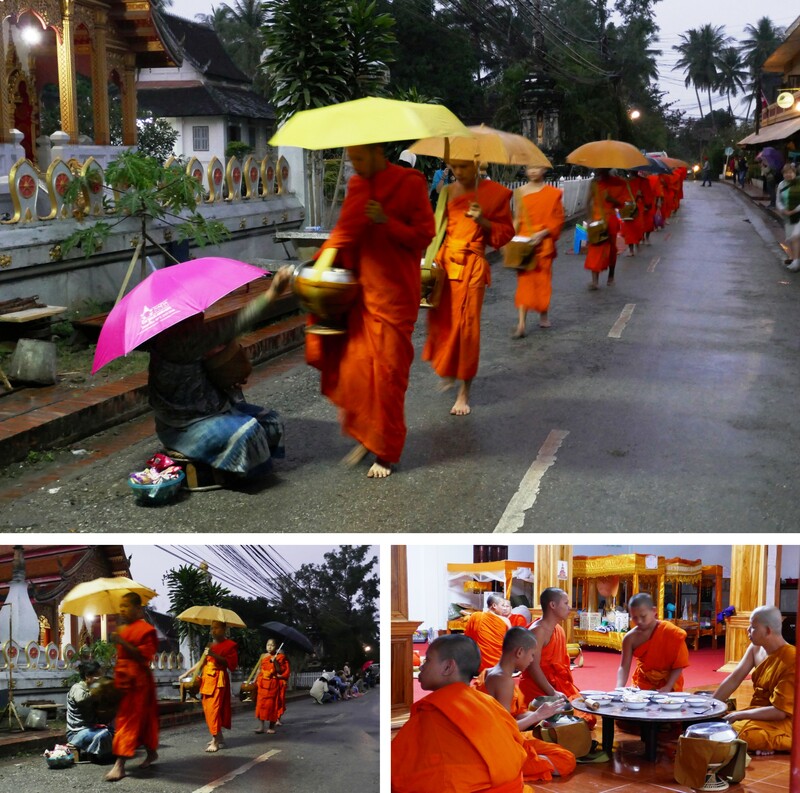 The next day, we woke up early and went to see the Alms ceremony – a daily ritual performed by the monks who pass through the streets collecting food prepared by the local people. It was drizzling and we were waiting for the monks to arrive. At around 0615 hours, the monks started arriving and we could see the locals giving freshly prepared food (mainly rice). It is a belief here that the locals feed the monks and the monks in turn feed the poor. So if you have no food or place to stay the monks provide you with the same. 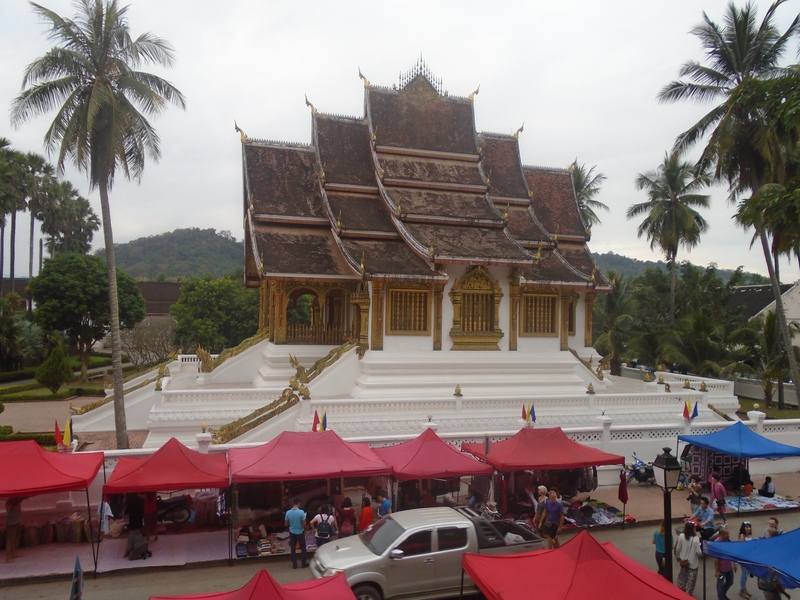 This is a must attend ceremony for people visiting Luang Prabang. A useful tip – Do not go to the main street to watch this ceremony as it is very crowded and touristy and you miss out an authentic local experience. 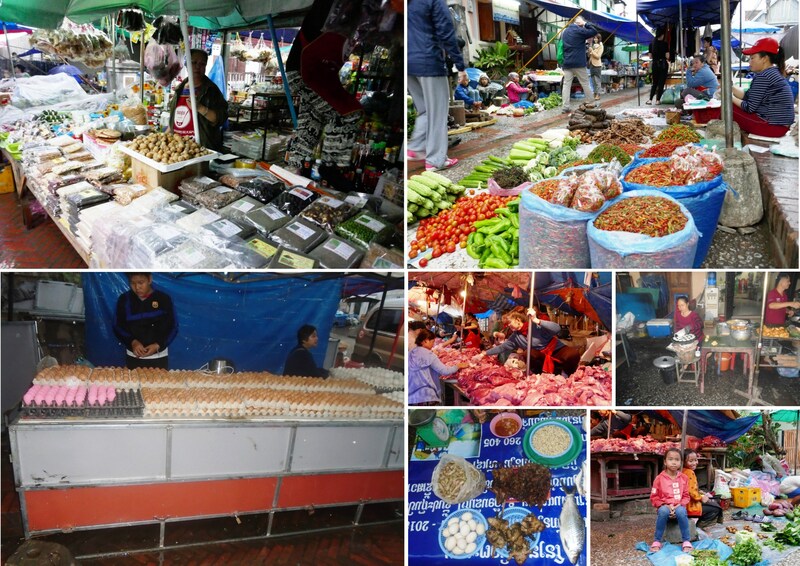 After the ceremony, we visited the morning market to find variety of eggs, fresh vegetables, live fish, meat, chicken, frogs, rats – yes you read it correctly, rats which form part of the meal for the locals. It is here that the locals do their shopping. Sellers from across the river come here in the morning, sell their goods by late morning and only come back the next morning. We tasted some sticky rice with spicy sauce and later sweet coconut cakes which was simply sumptuous. We got back to the boat at around 0730 hrs and post breakfast, we had a drill session (training session) as we were going to sail today. 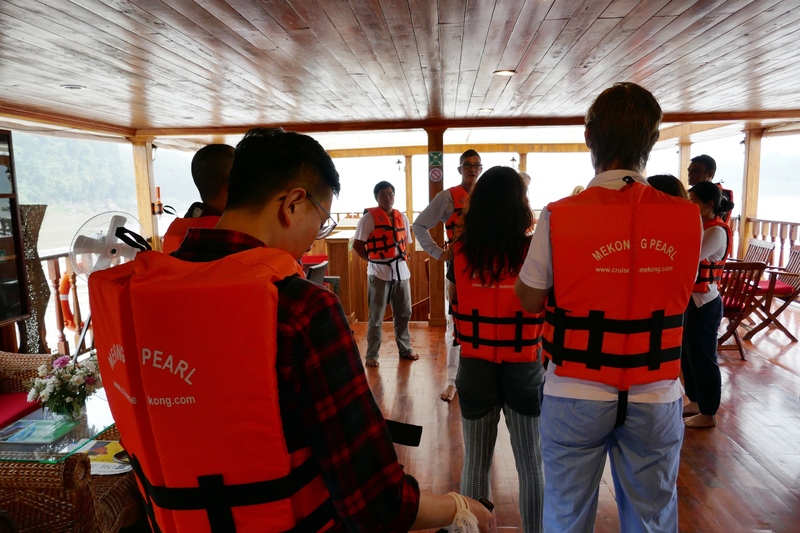 We were instructed how to wear the life jackets and dos & don’ts in case of an emergency. 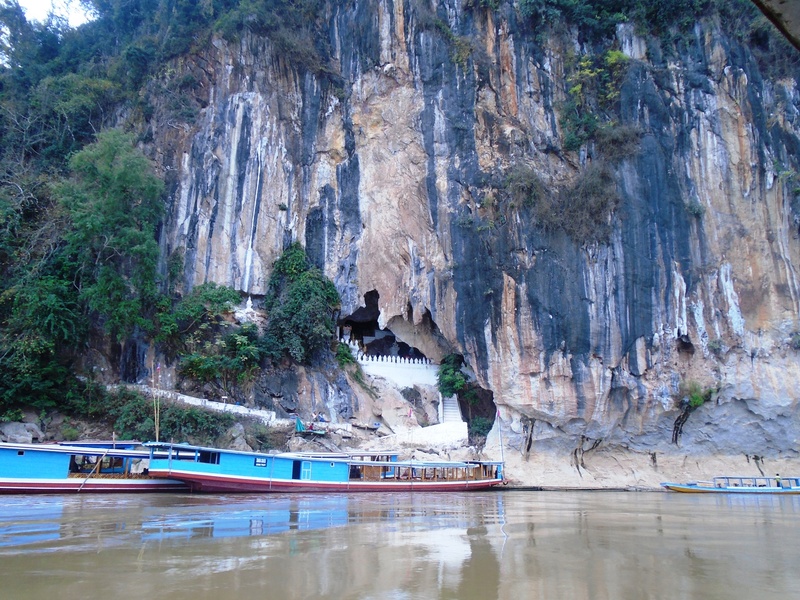 We started sailing downstream towards the famous Kuang Si Falls after cruising for 90 minutes. We docked our ship at a suitable place and then took the tuk tuk – similar to our auto rickshaw, to reach the entry gate leading to the waterfall. 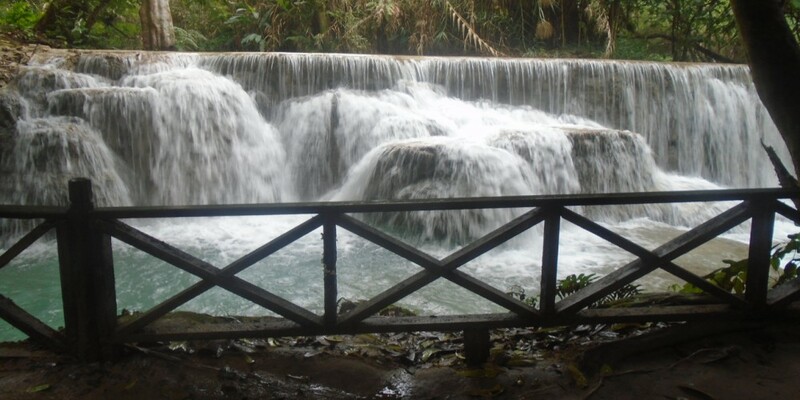 It is a 20 minutes walk from the entrance gate to reach the iconic water fall. 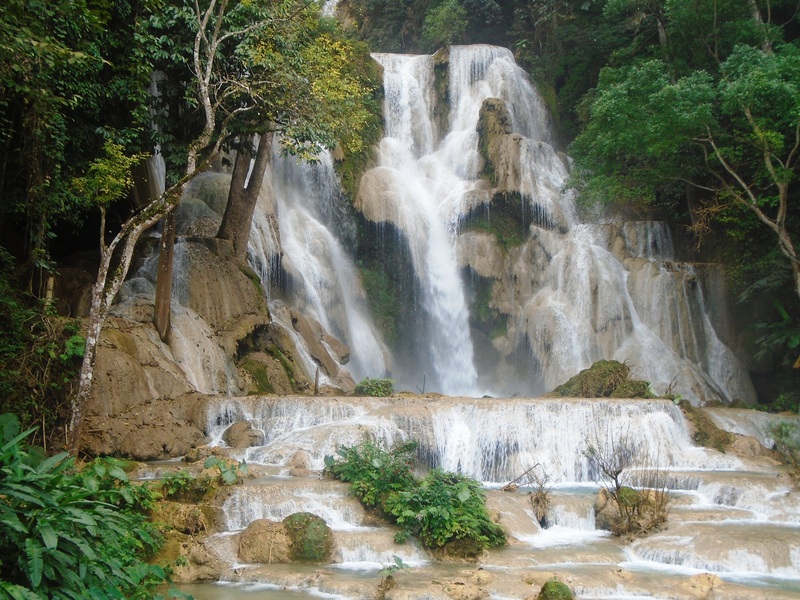 Kuang Si Waterfall is the biggest in the Luang Prabang area. It has three tiers and a spectacular water drop into the pool below and then flowing water downstream. It is also possible to climb to the top of the waterfall , avoidable on a rainy day though and it did rain when we were there. . 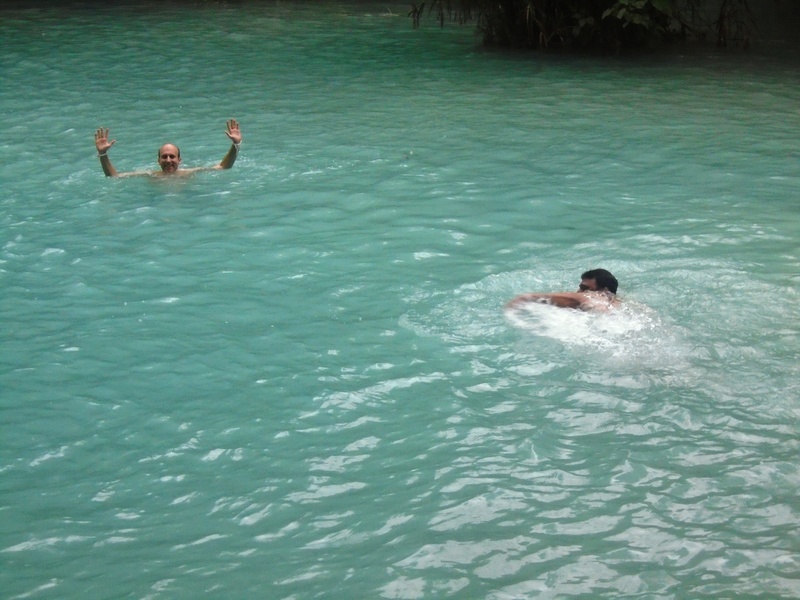 Swimming in the cool turquoise water is a must do and there are wooden huts in the proximity where you can change. 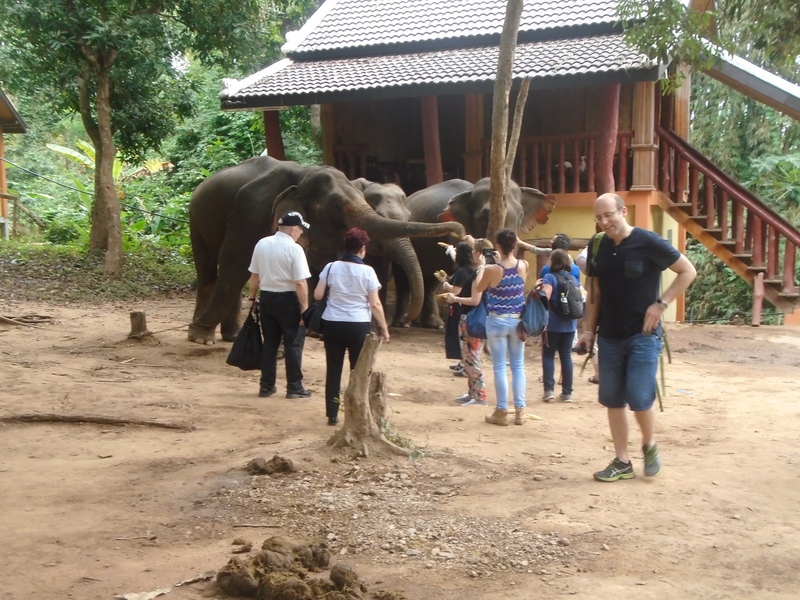 The experience was “Wow in Lao”. 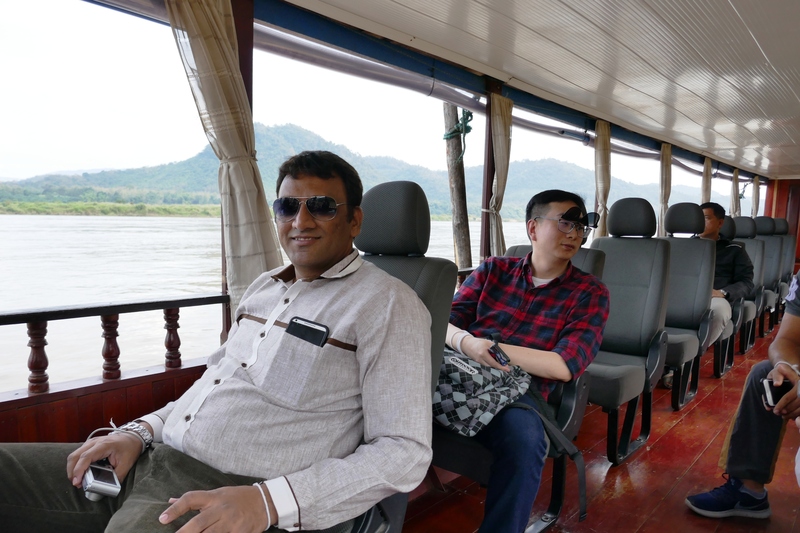 Later we cruised back to Luang Prabang and had our lunch on onboard. 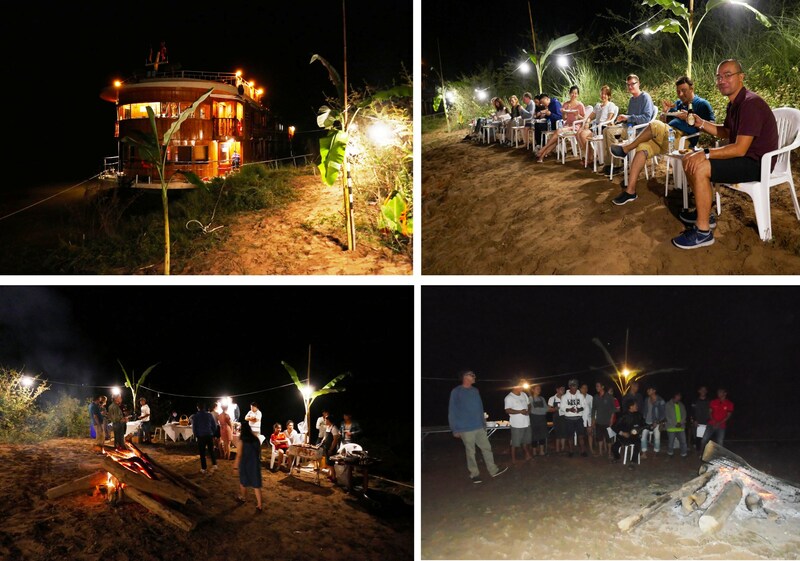 In the evening, we were invited by a Laotian family for dinner. We were treated with a mushroom & chicken soup, with spring rolls , followed by steamed rice and fish prepared in a leaf. Local wine and Lao Khao were on offer as well. I enjoyed being a part of this unique Lao experience. Post dinner we visited the night market. A good place to get some souvenirs for friends-n-family. 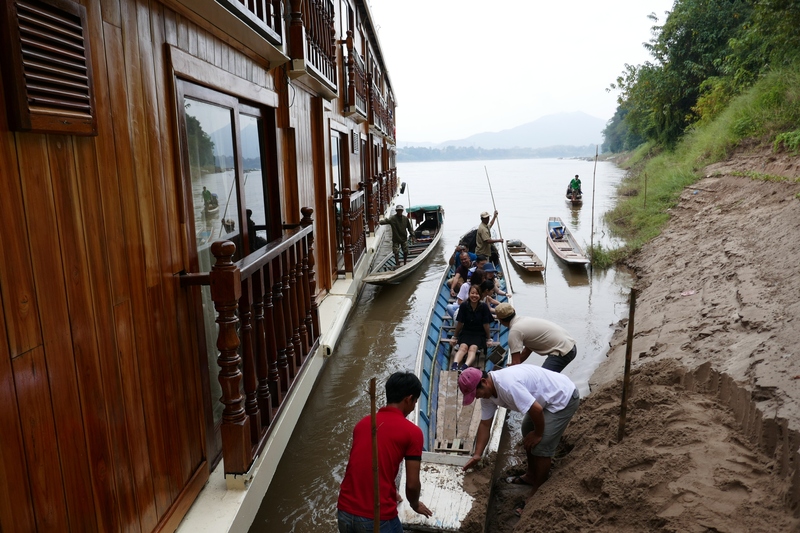 The following morning post breakfast, the ship started its upward journey on the Mekong. We started cruising and in 2 hours we reached a deserted island and after having our lunch on board the vessel , we went in a small boat to explore the Elephant Camp. Laos was known as the Land of a Million Elephants (Lane Xang). Now there are a few thousands remaining. Some of these elephants help in transporting timber in the forest. However, with timber harvesting on the decline, these elephants would be high maintenance. Hence this idea of having an Elephant camp, where working elephants from harsh environments are rescued and used for touristic purpose. The peculiar thing about the elephants in Laos is that they have 5 nails on front feet and 4 on back unlike the African elephant which have 4 nails in front and 3 on the rear. 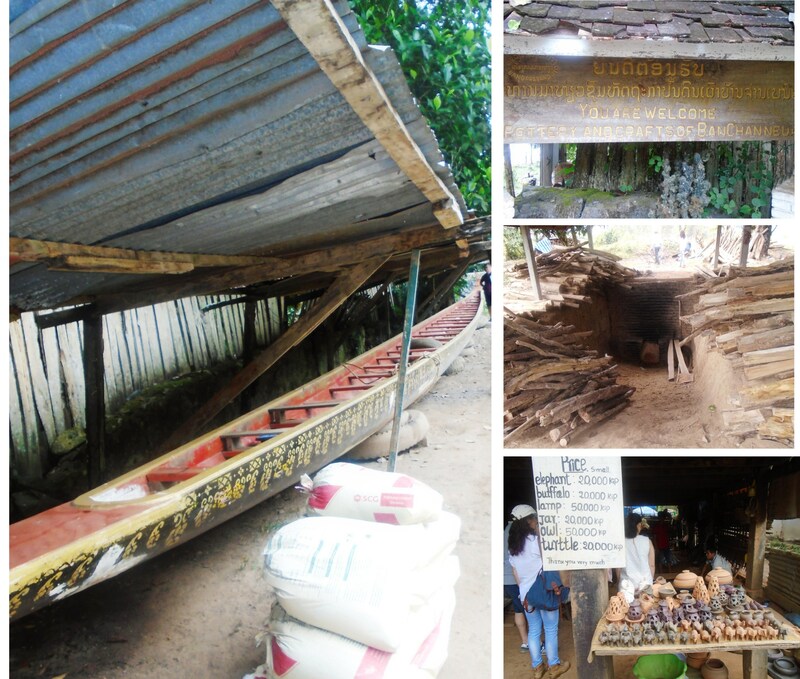 After spending some time in the Elephant Camp we walked through the crime free village and reached our small boat. 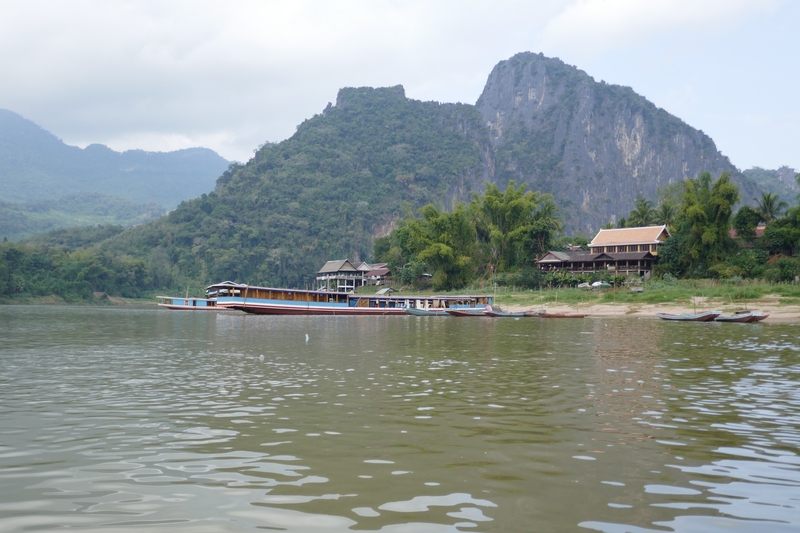 We crossed the river and reach the Pak Ou caves on the other side. There are two caves here. 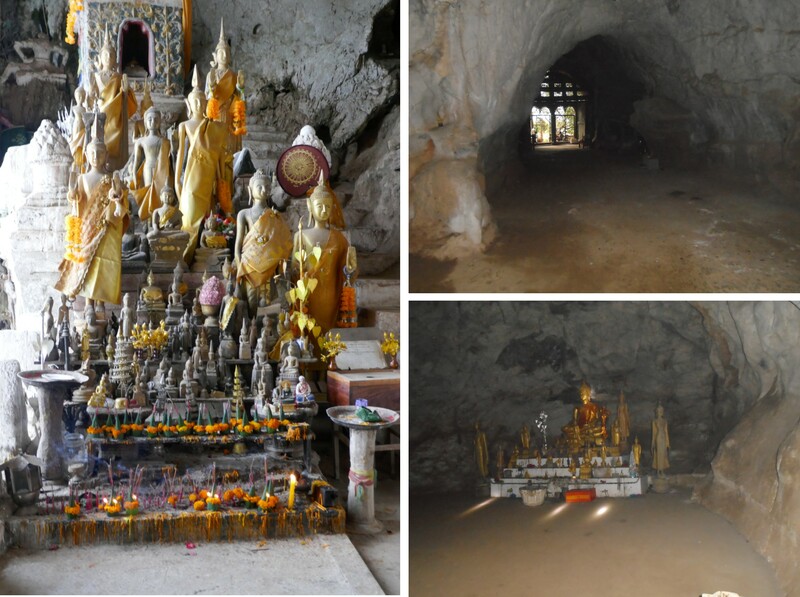 The lower cave is known as Tham Thing and the upper cave is known as Tham Theung. 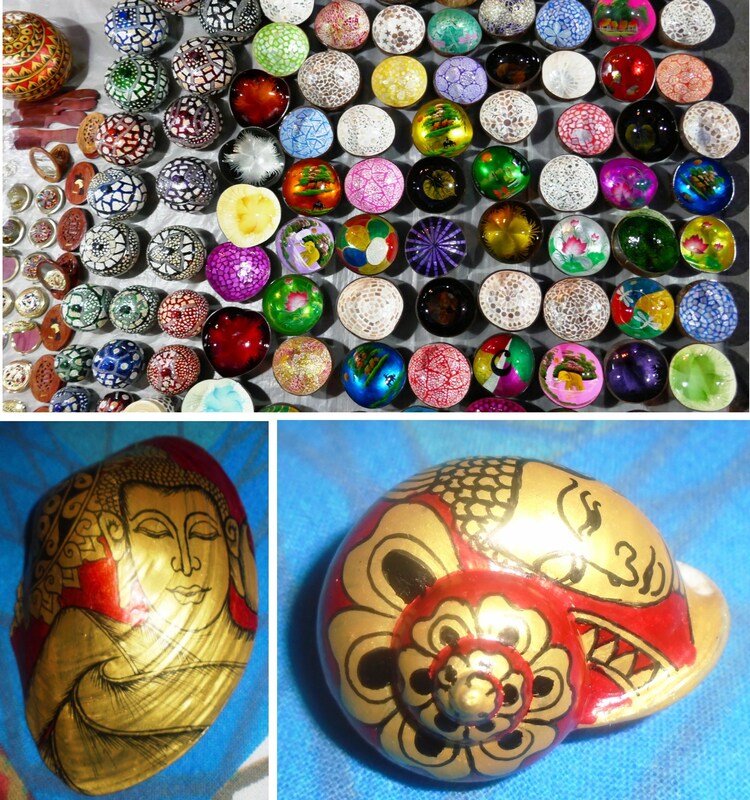 These caves are known for numerous small Buddha statues laid out on the wall shelves. We visited both the caves and later went around these caves through the jungle path to reach a village. In this village we saw a small version of the rice whiskey distillery and learnt how whiskey is prepared. Good quality sticky rice is mixed with yeast and kept in a sealed container or vessel for 4 weeks. Later it is heated in the distillery and the condensation causes the drops of liquid to drip through a small hole in the centre into the bottle. Later we returned to our vessel for a very special barbeque night on a deserted island. The night was indeed special and we all were looking forward to the wonderful evening. After relaxing for a while I enjoyed some quite moments on the sun deck and later went out on the sandy beach to party. 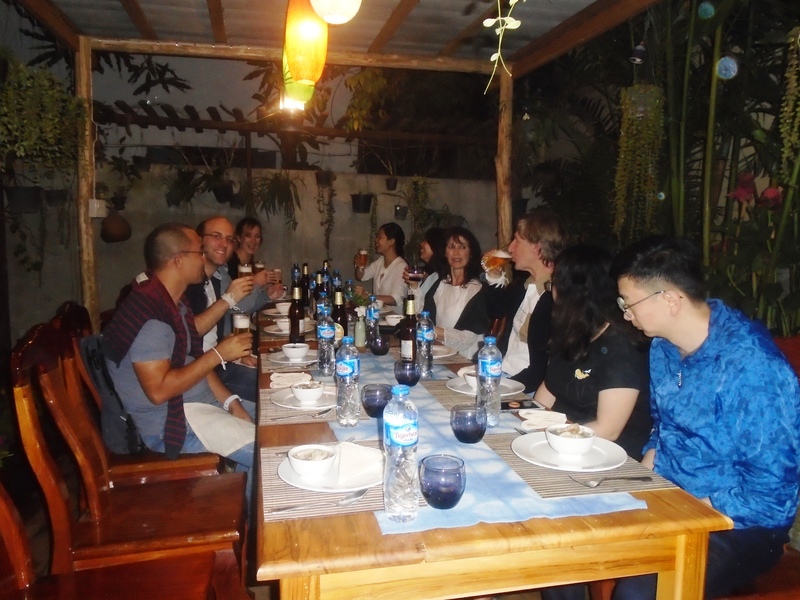 The party started with few drinks and after which we feasted on the barbeque dishes prepared by our chefs. The place was very nicely decorated and the food was great in taste. The vessel crew also sang local songs for us and later Balloon lanterns were lit and released into the dark sky. It was a truly captivating moment for me. With these lovely memories we went to sleep late in the night. As all good things come to an end, today was going to be my last day on this beautiful journey. Post breakfast we started sailing back downstream to see the pottery village (further down from Luang Prabang). Due to the low water levels we had to dock our ship about a kilometre away from the pottery village. Our crew arranged for a small low speed boat on which we boarded and reached our first destination – the pottery and the art cultural village. At the entrance we saw a long racing boat and were informed that every year it was used for the racing event. To win a race minimum 60 people were required to row the boat. Any number less than 60 lowers your chances of winning. The boat speed could easily reach 30 kmph with 60 people rowing the boat. Our tour guide also briefed us how pottery was made. 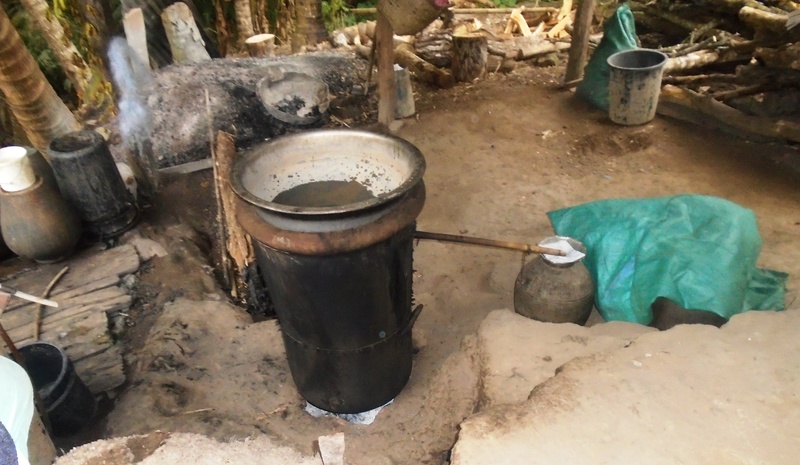 After shaping the mud, the pot is placed in an oven for 24 hours. He showed us a large pit created with a hole and heated bricks. The pots are placed inside this pit and heated for about 24 hours. 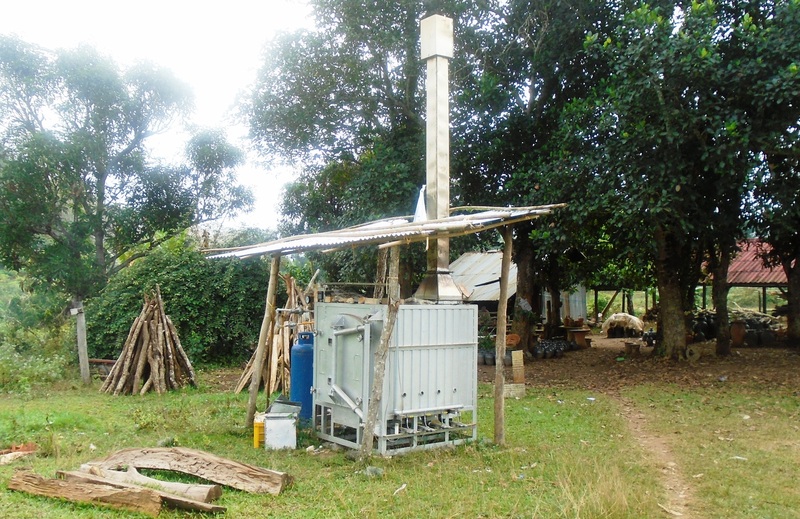 They also had a gas furnace but it was not sufficient for large quantities. 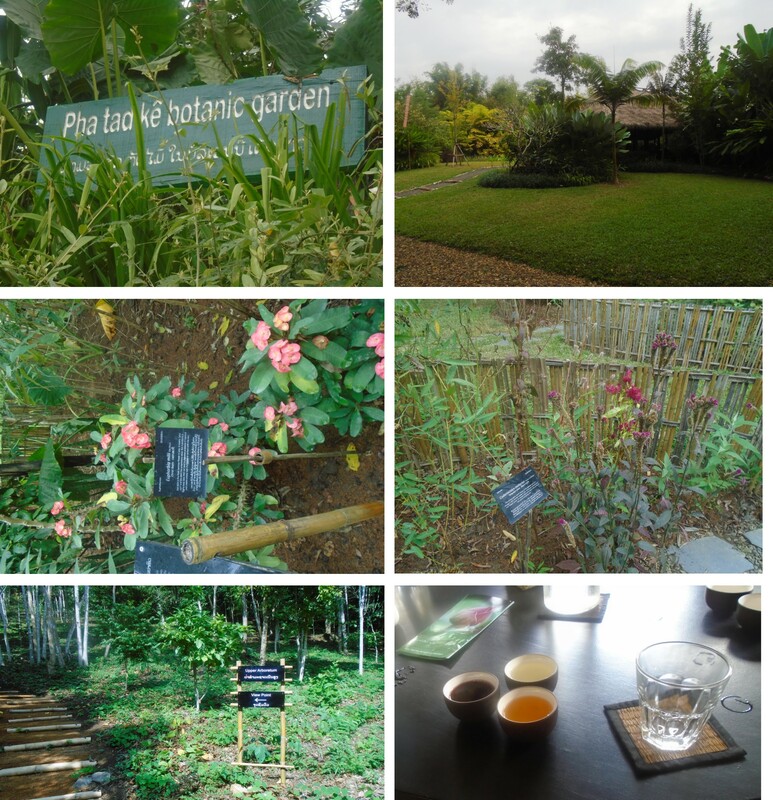 Later, we visited the botanical gardens Pha Tad Ke. Here we were briefed and asked to spend around an hour to explore the place. From ginger plants in the Ginger Garden to the medicinal plants in the ethno-botanic section, the place has a restaurant where you have a wide variety of tea. We returned to our vessel and had our last delicious meal with the group together. We wished each other a safe onward journey to their respective countries and ended the tour on a happy note. 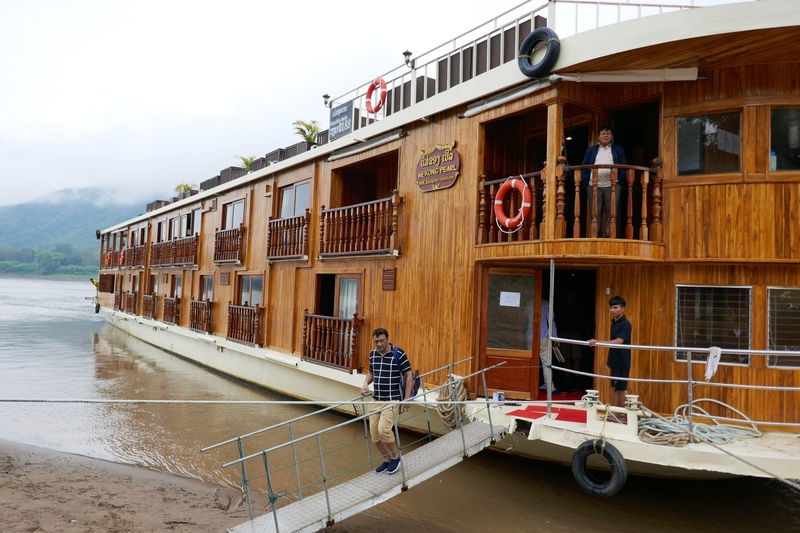 I am sure everyone reading this blog would by now be interested visiting this UNESCO town and experiencing the mighty Mekong river cruise. The destination is just half a day flight from India, with easy visa and is a very safe place to visit.